Gilat Satellite Networks Ltd. (NASDAQ: GILT) has been selected by a leading Latin American operator for the delivery of a full scale SkyEdge II network comprised of hubs and VSATs for a national post office operation. The network will provide national connectivity to the Latin American country's national post office. As part of the project, Gilat will supply the national operator with a fully managed network connecting approximately 7,000 branch offices with SkyEdge II VSATs. The SkyEdge II network will also be integrated into the MPLS backbone as well as the operator's network management system. The network will serve to drive the growing need for postal services across the country, supporting local and regional communities with essential communications and transactional connectivity. Gilat's SkyEdge II is a multi-service platform enabling the delivery of high-quality voice, broadband data and video services for diverse environments including enterprises, rural networks, cellular backhaul and government network applications. 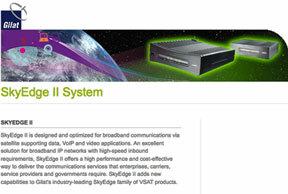 SkyEdge II is a standards-based system using DVB-S2 and DVB-RCS. With better efficiencies and full adaptivity for both the inbound and outbound channels, it provides higher performance and service up time that serves the growing requirements of a range of end-users. Gilat's diverse portfolio of SkyEdge II VSATs are all supported by a unified platform, offering service providers the most suitable product for their application needs as well as the flexibility to evolve their networks.